List of Passers for October 2014 Criminologist Board Exam Results - Balita Boss! The Professional Regulation Commission (PRC) released the October 2014 Criminologist Licensure Examination results. The official results were released on Wednesday, November 26, 2014. The examination was conducted by the PRC on October 19-21, 2014 in Manila and all regional offices nationwide. A total of 12,245 out of 28,187 examinees passed the October 2014 Criminologist Board Exam, according to PRC (via PRC Website). View or download the performance of schools in the October 2014 Criminologist Licensure Examination at prc.gov.ph. 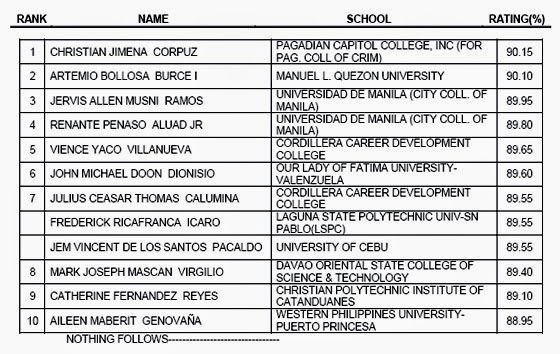 PAGADIAN CAPITOL COLLEGE, INC graduate CHRISTIAN JIMENA CORPUZ topped the October 2014 Criminologist Board Exam with a passing rate of 90.15 percent. The Board of Criminology who administered the October 2014 Criminologist Board Exam were Hon. Lourdes W. Aniceto as Chairman, with Hon. Ernesto V. Cabrera as member. Registration for the issuance of Professional Identification Card (ID) and Certificate of Registration will be on December 2-5, 2014. The date and venue for the oathtaking ceremony of the new successful examinees in the October 2014 Criminologist Licensure Examination will be announced later, the PRC said. Criminologist board exam covers the following subjects: criminal jurisprudence, procedure and evidence, law enforcement administration, criminalistics and crime detection and investigation and sociology of crimes and ethics and correctional administration.. In April 2014 Criminologist Licensure Exam, a total of 4,688 out of 13,873 successfully passed the said exam. Van Allen E. Padolina of De La Salle University-Dasmariñas topped the April 2014 Criminologist board exam with a score of 92.50 percent.